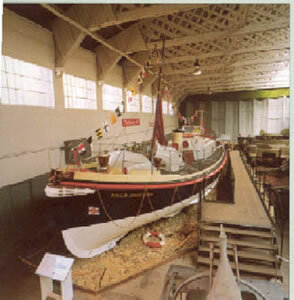 Just before the outbreak of World War II, the RNLI placed a larger and more powerful lifeboat on station at Bembridge. Built in 1939 by J S White, JESSE LUMB was a 46ft Watson fitted with twin Ferry VE4 40hp diesels . The boat was named "JESSE LUMB" by Miss A.L. Lumb in memory of her brother on 21 July 1939. Her 40 horsepower diesel engines were designed to work underwater and gave her a top speed of 8.5 knots. During the war she saved some 138 persons, many during wartime conditions. In 1940, the RNLI Bronze Medal was awarded to Coxswain Harry J Gawn for rescuing the crew of the Hired Anti Submarine Trawler KINGSTON CAIRNGORM that was flooding in a blizzard on Chichester Bar on the night of 29/30 January 1940. In an operation involving several approaches, her crew of 21 was taken of and landed at Portsmouth. The lifeboat had been at sea for 14 hours with the Coxswain at the wheel the whole time and at the end of the service the lifeboat’s deck was covered in ice. On the morning of 5 December 1947, the trawler ERRAID, which was on tow from Portsmouth to Plymouth, broke adrift and was being driven ashore. The Bembridge lifeboat JESSE LUMB eventually succeeded in taking off the crew of 18 when the vessel was within a few hundred yards of the shore. In 1968 she also stood by the submarine HMS ALLIANCE when it stranded on Bembridge Ledge. JESSE LUMB’s service at Bembridge ended in 1970, but she spent many years in the relief fleet and, as the last wartime lifeboat of this type in service, she was moved to Duxford for display in 1980. JESSE LUMB can be seen at the Imperial War Museum, Duxford in a display dedicated to wartime air-sea rescue. Source; George Hogg, Advisory Committee, December 2008.